According to the Qabalistic view of the universe, the universe is separated into four close but distinct “Worlds.” These worlds came into existence with the creation of the sephirot (spheres) by the Path of the Flaming Sword. The four worlds each formed out of the previous world, each evolving from the previous world. As the worlds formed they became more substantial eventually reaching physical manifestation in the very last world. 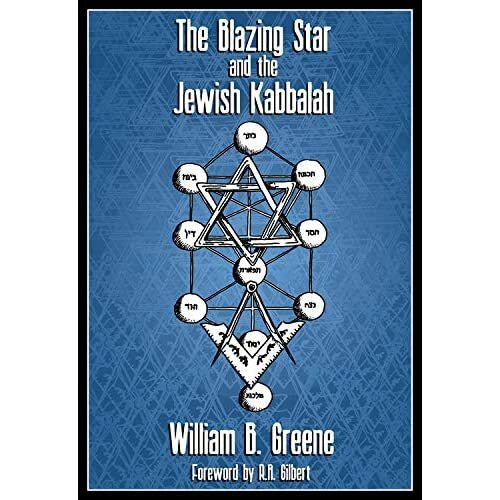 Tau Malachi, a teacher of Gnostic Kabbalah, calls the four worlds, “universes.” The word, Olam, can mean world or universe. The term universe is fascinating when you think of modern science’s recent (early 2000s) conclusion that there are parallel universes with ours, at least one, and that’s where gravity leaks into us from(! ), as well as making String Theory or M Theory finally work. The two parallel universes science has “discovered” are like membranes dancing together and when I saw a television documentary about this on the Science Channel they looked like they were, um, copulating. 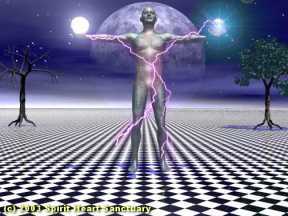 I thought hey, that’s the sacred feminine and the sacred masculine, a Sacred Marriage visible in physics. Anyway, there are four great universes in Kabbalah (or worlds as traditional kabbalah called them) and you can see their delineations in the Tree of Life picture on the right. Read this article by Tau Malachi on the four worlds, actually an excerpt from his book, Gnosis of the Cosmic Christ: A Gnostic Christian Kabbalah. (Don’t be confused by the fact that he has Adam Kadmon as the first world/universe, and numbering the other four traditional worlds/universes as 2 thru 4). The first of the four worlds is Atziluth and the first letter of the Tetragammation Yod is attributed to it. It is the world of the Divine and the Great primordial Fire. 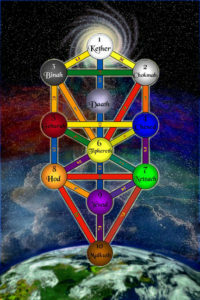 The three supernals Kether, Chokmah, and Binah are located therein. The second world is Briah and it is often called the world of creation. The letter Heh of the Tetragammation is assigned to Briah. The Briah is the dwelling place of the Archangels and the Great Primordial Waters. Chesed, Geburah, and Tiphareth are in this world. The third world is Yetzirah or the world of formation as it is commonly called. It is the abode of the angels and Primordial Air. The letter Vav of the Tetragammation is assigned to Yetzirah. It is believed that Yetzirah roughly approximates to the astral plane, because Yetzirah is the world where the formation of all things occurs just before they receive physicality. Netzach, Hod, and Yesod are assigned to this world. 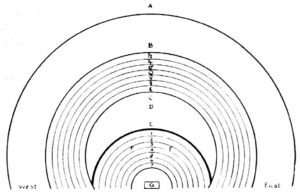 The physical active world of Assiah is the fourth and most material of the Qabalistic Four Worlds and the heavenly spheres of the ancients are assigned to it — the seven planets of ancient astrologers (two of the seven “planets” are the sun and moon). 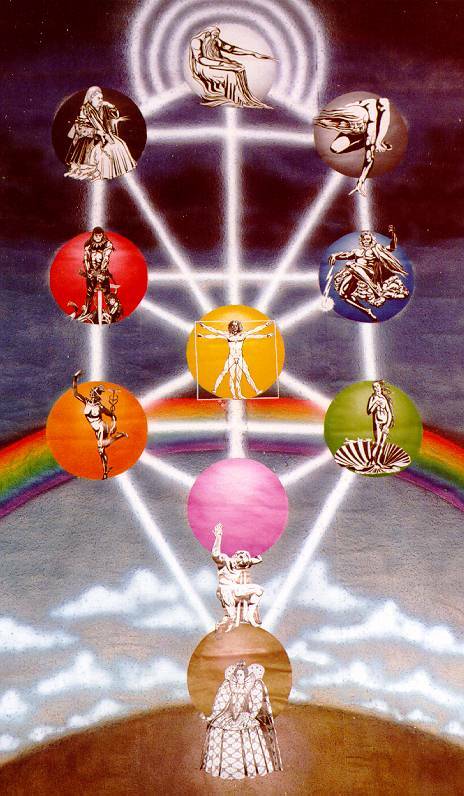 Since there are ten Heavens and also ten sephirot on the Tree of Life, each Heaven gets a ToL sphere assigned to it. In many Qabalistic rituals the particular planet’s energy is invoked to aid in the operation. 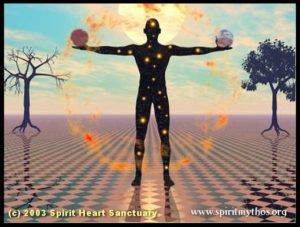 On an interesting side note, some authors have ascribed the ten heavens to the mundane Chakras of the body, likening each of these energy centers to physical centers of manifestation. 2. ZODIAC TWELVE: Mazlot, meaning “the Stations” Represented by the twelve Zodiac star constellations and assigned to Chokmah. 4. JUPITER: Tzedek, meaning “the Righteous” Represented by Jupiter and assigned to Chesed. (Note this is one of two root words in Melchizedek, which means King of Righteousness, or Righteous King). 10. EARTH: Olam Yesodot meaning “the World of Foundations” Represented by the Sphere of the Elements and assigned to Malkut. http://www.digital-brilliance.com/kab/mag_imag.jpg A neat rendition with Queen Victoria and Queen Elizabeth used as two of the Sefirot! (spheres). STUDY QUESTIONS: Cut and paste these questions and put in an email to the Mystery School with Qabalah Lesson 13 in the subject line. 1. How many “Worlds” are there in Qabalistic thought? 2. What is the name of the first world? 3. What world is the home of the Archangels? 4. What sephirah is the only one in the world of Assiah? 5. What is the name of the third Heaven of Assiah? 6. Nogah means “the Star,” TRUE or FALSE. 7. The tenth and last Heaven is assigned to what sephirah? This lesson is different, but simple. It’s report time! Do an Internet search for Adam Kadmon or visit the Kabbalah FAQ Website and see what they say about this mysterious qabalah figure. Send a one paragraph definition of what / who Adam Kadmon is. And send links to at least two articles you found on the Internet about him. 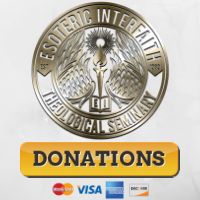 Send all to the Mystery School with Qabalah 14 Adam Kadmon from __________ (your magikal name), in the subject line. You get Extra Credit if you also find and send the URL to another picture of “him” for this page. Mention that you want it to count for extra credit for Qab lesson 14. Note: Adam Kadmon is sometimes spelled Adam Qadmon.